Get the best in Data integration! Contact Our Experts! GrayMatter provides pre-built industry specific analytics solutions like Airport Analytics, Finance Analytics and Insurance Analytics. 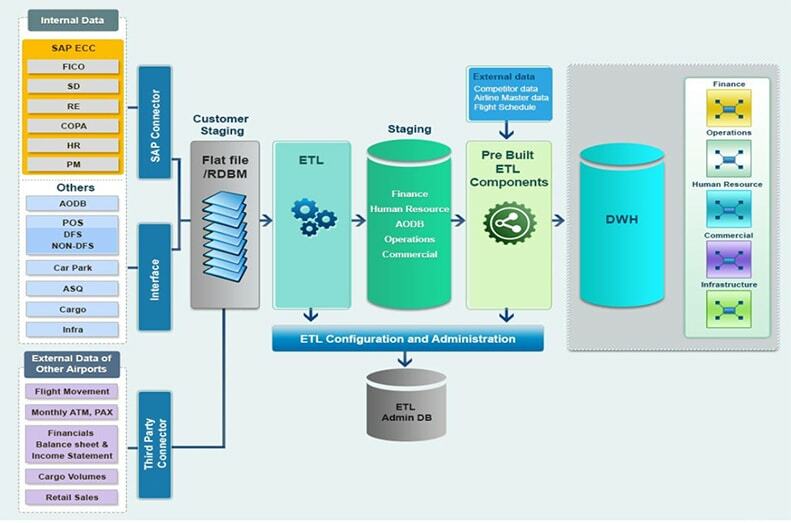 The ETL is pre-built i.e., the extraction programs, transformation routines and load procedures are pre-built and hence the complete enterprise data integration piece does not need any from-the-scratch effort. The image below depicts the architecture of Airport Analytics wherein data from diverse sources like AODB, POS, ERP, CRM, ASQ etc. are extracted, transformed and loaded to target Data Warehouse. The ETL can be built on any chosen tool e.g., PDI, SAP BODS, MS SSIS etc. A typical business scenario is one wherein data needs to be collected from numerous log files, processed and stored in an easy to query format so that business users can easily query this data for insights. The problem statement is complex because application log data needs to be collected from hundreds of servers where the velocity of log data is high (MBs/second). The data collected needs to processed and enriched with the help of reference/look up data and finally loaded into target database – all this, typically, in less than a couple of minutes. We have the proven expertise to pull in Big Data from several data sources, process it and store it in a Hadoop DW. The diagram below represents the typical architecture deployed for one of our customers wherein data was extracted from several source systems and then the data was transformed and loaded into Hadoop Data Warehouse. End-user visualizations, reports and queries are run on top of this Data Warehouse. Today, most entreprises find themselves in a position to producing and storing ample amounts of data every day. As in abundance, it becomes quite difficult to tap onto the potential of the meaningful information out of this amount. With Gray Matter Data Integration services, you no longer need to struggle with the complex ETL processes anymore. No more data preparation to set up complex ETL processes. Our ETL services accesses your data wherever it is stored , in whatever format and brings along information being used by your enterprise. We enable performance tuning for faster ETL processes to an extent of 10x. Not only this, we provide pre-built industry specific analytics solutions and hence the complete enterprise data integration piece does not need any from-the-scratch effort. Our ETL service make sure to maintain end-to-end security for your data sources. The data sources are stored in our high-speed and secure data warehouse that is protected 24/7 and are a right choice of stack for Data Warehouse. What matters to us above all, is, our customer’s most sensitive data and its security and we are totally committed toward this. What if there is a sudden change in your data? No worries, our ETL service makes sure you never miss an important event and handles it, in no-time, already! We manage the data schema changes and restructure for optimisation purposes. We understand your concerns and convert the data in the way you want it to be by enabling automatic mapping of integrations. We can also customize the mapping for you incase you need to take a full-control over it. 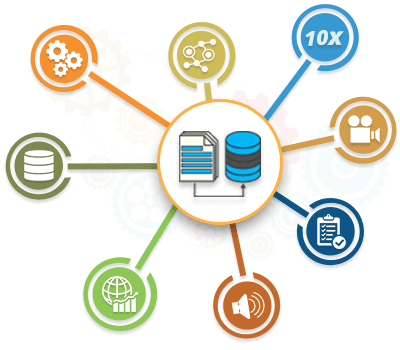 Our data integration services leverage the capacities of ETL service thereby saving your time, efforts and money, without compromising the flexibility and scalability required for data integration. GrayMatter has successfully solved complex data integration problems for customers across the globe, for technologies across the board. GrayMatter has expert teams dedicated to each of the major data integration implementation stacks like SAP BODS, SAP BW, Pentaho Kettle, MS SSIS, Informatica and Talend. GrayMatter also has exceptional competencies in Master Data Management, Data Governance and Data Quality which support and augment the objective of Data Integration. Equipped with all these competencies and rich experience of over 2 million person hours, GrayMatter adopts an end-to-end solution approach consisting of data integration consulting followed by seamless execution.